John and Merv: Easter 1998. Salmon Fever! Now semi-retired, I decided to try my hand at the very frustrating, but physically and mentally rewarding sport of salmon angling. 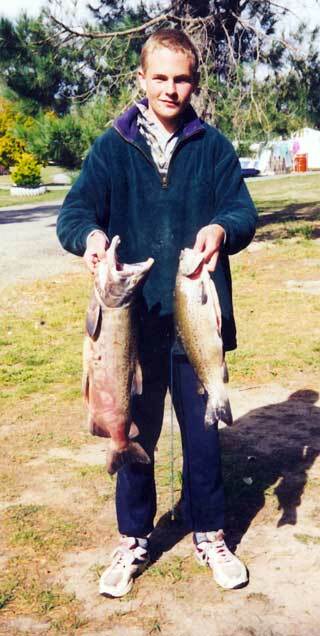 Krent’s 8lb salmon and a trout. The first trip was to the Rakaia River. After casting all day, suddenly, this snag started to pull back! Panic set in as this fish stripped nearly all my line from my new ABU 6500 reel. Following a mad gallop downstream I reached a point. Without an aqualung, I could no longer follow this very large ﬁsh. A long distance tug-of-war started. Sadly this salmon parted with my Zedi. Exhausted I headed back to the car in a howling sou’wester. The next trip was back to the same hole on the Rakaia. However this time I shared the hole with some other anglers who arrived by jet boat. After watching one of these guys hooking and losing a salmon (I’m not the only one) I watched as the next angler hooked and chased by jet boat downstream, then landed a nice salmon. I immediately made a mental note (ask wifey to buy herself a jet boat, after all, it would look the part on the back of her 4×4, may even impress the neighbours). Suddenly I was jolted from my daydreaming with a screaming reel. This time, I burnt my thumb trying to slow down this salmon which felt like a bag of cement with an outboard motor behind it. The same chase off downstream (without the jet boat) but accompanied by one of the guys with a salmon net, many thanks, sorry your name eludes me. But it is true, I can really swim (difficult with a ﬁshing rod though) and I hope you dried out as quick as I did. You are correct, this game could sure bring on a heart attack – what a way to go! This salmon also departed my company. By now the salmon fever was reaching a high pitch. Next trip, picked up John, my cobber, at some ungodly hour of the morning and off to the Hurunui River Mouth. We were ﬁshing shoulder to shoulder as we untangled lines with very friendly anglers. However, kahawai, kahawai, and more kahawai for yours truly, but John went home with a 14lb salmon, his first for the season. My next trip was back to the Rakaia very early in the morning where I shared a new salmon ﬁshing hole with a husband and wife team. The wife, a well known Redcliffe artist, proceeded to impress me by hooking and landing her salmon limit bag. It must have been hard work watching her husband and myself continuing to thrash the water. I still don’t know how this gentleman managed to convince his wife that it was better for her to carry 40lb of ﬁsh back to their car while he carried the very important rods. You are both correct I will never forget the ﬁrst salmon I landed and thanks for the tips. 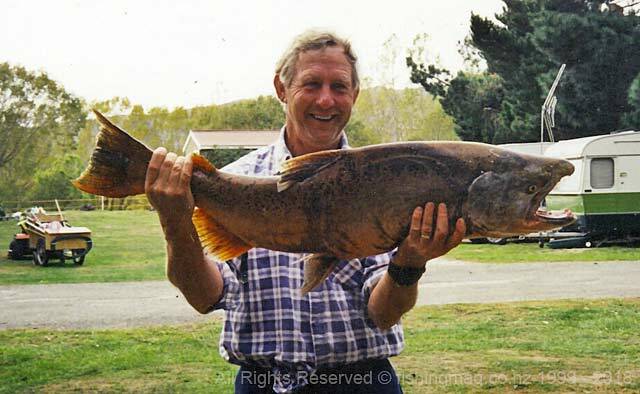 Back to the ﬁshing: suddenly, a hard strike, a short play and I finally landed my first 11lb salmon, “YAHOO” echoed across the Rakaia Riverbed. range of tackle to the ﬁshing hole. However, no success this day, so back to camp for a few tinnies and a chance to see Melva and Ngaire in daylight. Krent, our ﬁfteen-year-old, mad on ﬁshing nephew arrived from Dunedin to show his uncle how to catch ﬁsh. 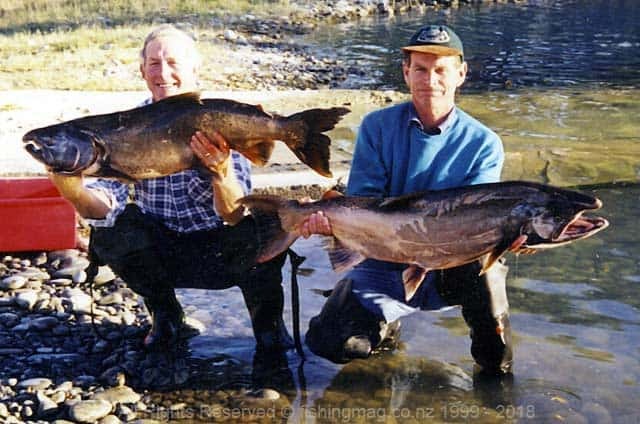 The next day, it was back down to the Duntroon area and we started donating tackle to the hungry Waitaki, then soon after, John and I, heard a distant call from Krent “come and see the salmon I have caught Uncle Merv.” John and I met Krent coming over the rise with a smile from ear to ear, accompanied by an 81b salmon. Not bad for his ﬁrst salmon trip! I tied on a brass Zedi and began the process of cast and retrieve. Drifting into dreamland, a hard-hitting salmon took the Zedi. An attempt to break for freedom and a short play saw a well-conditioned 24lb salmon on the bank – finally quietened Krent down. Back to camp for tinnies and photos. That same evening saw us back at a different hole where Iohn landed a big 25lb salmon, then I walked to the other end of the hole after hearing a distant “YAHOO” to see Bob with a 22lb salmon on the bank. This was great as Bob had lost two fish previous to this. We travelled back to camp in the 4×4 and Bob’s car, which he thought was a 4×4, for ﬂash light photos and some dinner. After a spell of very successful trout ﬁshing in the murky Upper Waitaki, we saw Krent off home to Dunedin with his salmon and several good size trout to treat his Grandfather and Uncles. Vowing to be back next season. The author and his Easter salmon. The next day John and I set off once again off to the ﬁrst hole. At this point I must apologise to the Duntroon anglers, we did not mean to catch the majority of the salmon over those days, after all, I am only a beginner. The locals had constructed a very unstable willow platform and it was on this platform that I very carefully fished from. An hour or so later a young lady yelled out that the salmon porpoising towards us had her name on it. Sorry Bronwyn, your name must have slipped off, as soon after I felt the hard shake of a salmon. Now balancing on a willow branch platform and playing a salmon is tricky, but after letting it run I managed to hold it close enough to the bank for John to expertly gaff – what would we do without our cobbers? This was a nice 23lb salmon. At this point, I must say that I changed to a new type of lure that proved very successful, which some of the locals dubbed a toy, but in the end, wanted to know where to buy this “toy” lure. Having waded to the other side of the hole and using this new lure I landed a fighting 5lb salmon and released two, 2 inches long salmon. Back to the willow platform and a short time later I let out the familiar “fish-on” shout and began to play another salmon. Many thanks to the local Ranger Squid (Graham) for the final gaff another 22lb salmon. A short time after this there was another ‘Fish on’ call from the other side of the hole and John played out and landed a 23lb salmon. Back to camp with a very dusty, dirty and smelly 4×4 and the end to our ﬁshing holiday. Not such a bad season of salmon fever after all.